Just because we humans are built to stand upright, doesn’t mean we can’t benefit from turning upside down. Making inversions part of your regular yoga practice can boost the benefits of your practice— body and mind. Inversions let you see the world in a different way…literally. First and foremost, they help you relax. But in addition, they will challenge you, and as you are able to hold these postures, you can’t help but experience a boost in self-confidence. 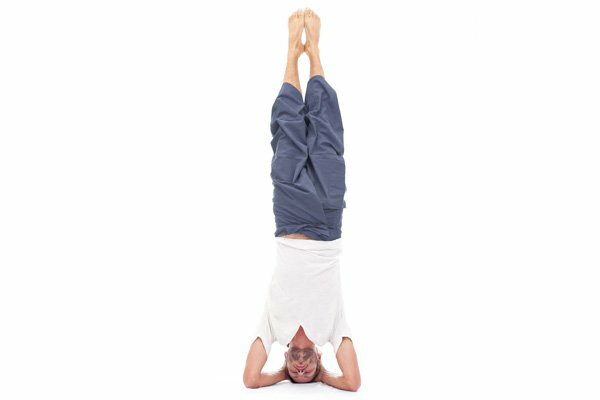 Physically, inversions are good for your heart and brain. When you turn yourself on your head, your brain gets flooded with fresh blood and your blood pressure and heart rate get a bit of a break. It also kick starts your lymphatic system, which boosts immunity. If you’re new to inverting, start with the more simple asanas, even those that keep your hands and feet on the ground, and work your way up to the more challenging ones. As you progress and work on your strength and balance, the wall will be your best friend. This posture may seem simple, but its benefits are anything but small. The posture can do everything from ease stress to help with digestive problems and even lower blood pressure. The key is not to be completely passive but to think about your breathing, focus on the sensations you experience, make sure your legs are straight with ankles together, and allow your body to melt into the earth as you breathe. Tip: It may help to use a support under your hips. Whether it’s a bolster or a blanket, it should be about six inches from the wall. If your hamstrings are too tight and you’re unable to straighten your legs with your thighs against the wall, it can help to move the support a few inches away. You do it when you move through a sun salutation, but holding Down Dog can open the back of the body, get your heart beating and calm your mind. Tip: If you’re new to yoga and struggle to straighten your legs, it’s ok to bend your knees slightly. Just work towards straightening your legs and pressing your heels toward the floor. You can also place your hands on blocks or move your hands further forward. Dolphin pose may look a little intimidating, and truth be told, can be challenging if you have tight shoulders and hamstrings. The good news is that you can work your way up to the more advanced versions of it. If you need to start in a basic plank to prepare your core muscles, go for it! Or if your shoulders are too tight to bring your hands together, keep your forearms parallel to each other. Can’t reach your heels to the floor, or have to keep your feet further away from your shoulders? That’s okay. Do whatever your body will allow.If you’re able to get into the full pose, you’ll see it’s a great way to strengthen your arms, shoulders, core and legs while also opening the shoulders and back of the body. Sound hard? Don’t worry. 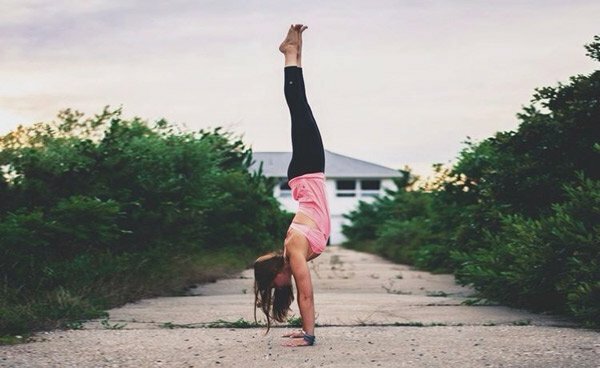 With a little practice and a lot of confidence – and the wall to help – I’m here to tell you, you can do a headstand. And the more you do it, the more you’ll feel your core get stronger and, even better, the more you’ll feel yourself being better prepared to take on life’s challenges. A few things to think about: your upper arms should be forearm width apart, allow the top of your head to support some of the weight, and keep your chin tucked slightly so the top of your head is connecting to the earth. Watching some of the great yogis kick their feet up and balance on their hands in the middle of the room makes it seem so easy, but mastering the handstand is a feat many yogis struggle for years to accomplish. The key is core strength, keeping your body in a straight line, creating a solid base with your hands – and, most of all, confidence. Once again, the wall will be your best friend until you feel steady enough to move away and trust that you have the ability to do a handstand with no assistance. Feathered peacock is the big brother of the dolphin pose. Just kick your legs and balance on your forearms. Easy, right? Well, with the wall as support, it doesn’t have to be challenging...but move away from the wall and it’s a whole new ball game. If that’s not enough, and you want more, venture into Scorpion Pose by bending your knees so your feet are over your head, or move into the splits while in the forearm balance. Inversions are fun! Be careful, though...if you’re relatively new to the practice, please use props(i.e. the wall) until you’re confident enough to try the advanced poses on your own. And remember, falling is all part of learning and that day that you are able to balance on your hands, you’ll feel like you can take on the world.